Can you believe I haven't bought a SINGLE piece of fabric in 2018! Well, that ended today. The fact is, my fabric buying is a bit more selective these days. I have a substantial stash that is very well stocked in lovely prints and knits, and quite a few special occasion fabrics for projects that I just haven't gotten around to. I also have developed sources in the US for many of the basic fabrics I use on a regular basis, and it doesn't make sense to buy things in Rome that I can easily obtain at home. 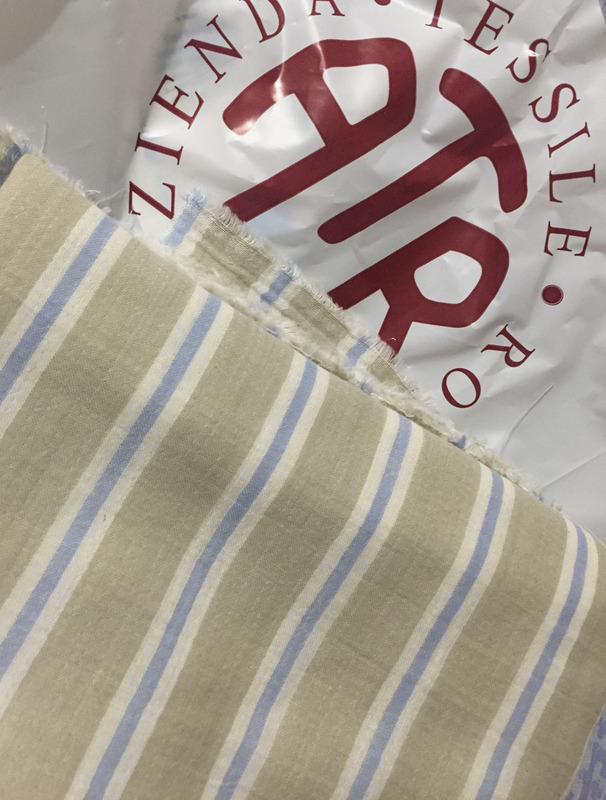 However, Italy produces some of the most lovely fashion fabrics in the world! Therefore, I resolved that I would buy a few special pieces of fabric, and they would be fabrics that are difficult for me to buy in the US or things that I am super excited to sew immediately and don't already have fabric for. 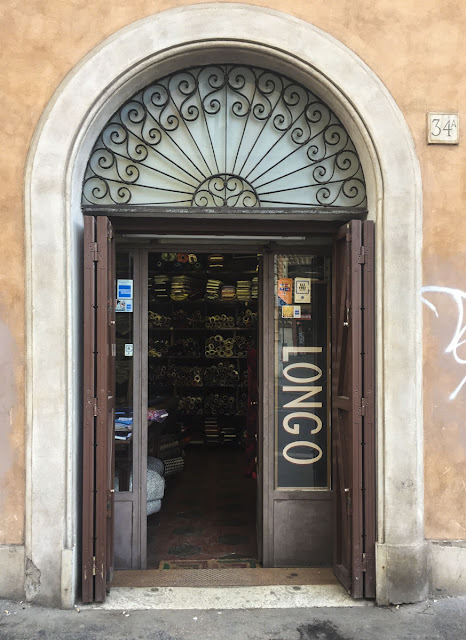 Fabric shopping in Rome is super easy because the best fabric stores are all clustered around Largo di Torre Argentina, which is right in Rome's historical district. 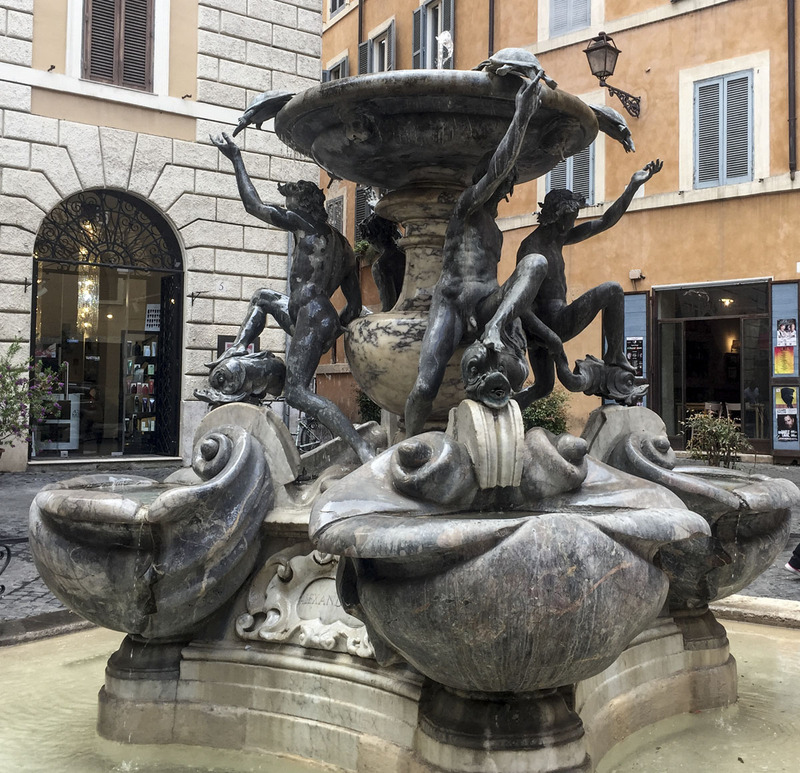 It is only a short walk from there to the Pantheon or Piazza Venezia, and it is also a major bus and tram stop. Largo di Torre Argentina is famous as the site of the ruins of three ancient Roman Temples and hundreds of cats. 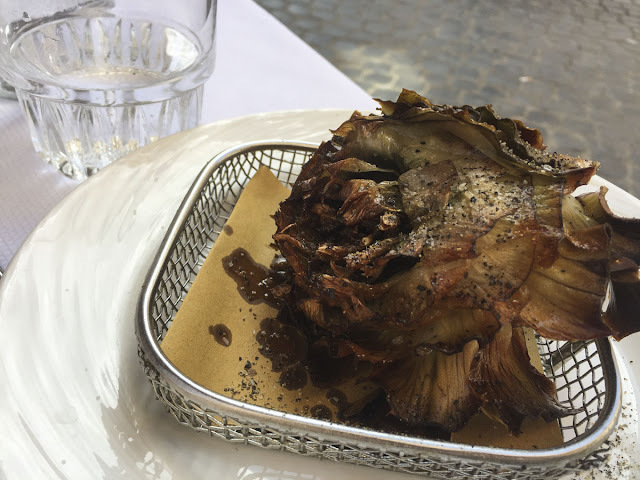 I decided to go to Francesco Longo e Figli first. 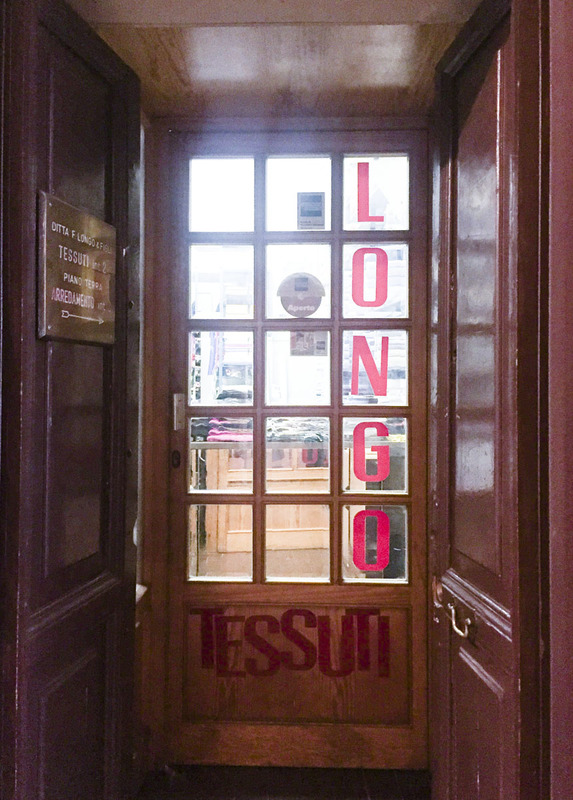 Longo is actually split into two stores. 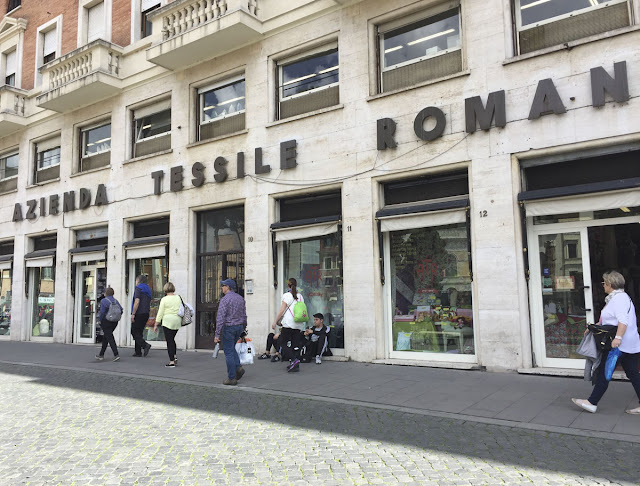 The easier one to find has a store front right on Via Florida, which is the street on the southern side of Largo di Torre Argentina. This store is filled with silks and wools. Technically Longo's address is 50 Piazza Dell'Enciclopedia, which is actually where their second and larger space is. See that 50 up on the wall near the left pillar? That's as much as a sign as you get. Fortunately they were nice enough to walk me over here (it's across an alley and 20 feet away from the first store). If you go into this huge, unmarked entry, you'll see this little, deeply inset door on the left. This is where they have all of their linen, cotton, denim, and knits. It's not as large as some other stores, but it is packed with bolts of fabric from floor to ceiling, and they are very nice and speak quite good English (at least the person who was helping me did!). The prices went from very reasonable to quite pricey (for some really lovely quality linens and wools that I looked at). Sadly I didn't end up purchasing anything here, but I was really tempted, and came back twice. They also have remnants stacked on the counters if you are just looking for a little fabric souvenir! Passed the Turtle Fountain in my wanderings. I just love how whimsical this fountain is. Next I went hunting for Fatucci Tessuti. After wandering around in the general vicinity for awhile, I finally looked up the address from the Selfish Seamstress's Blog, which is where I first learned about this shop. 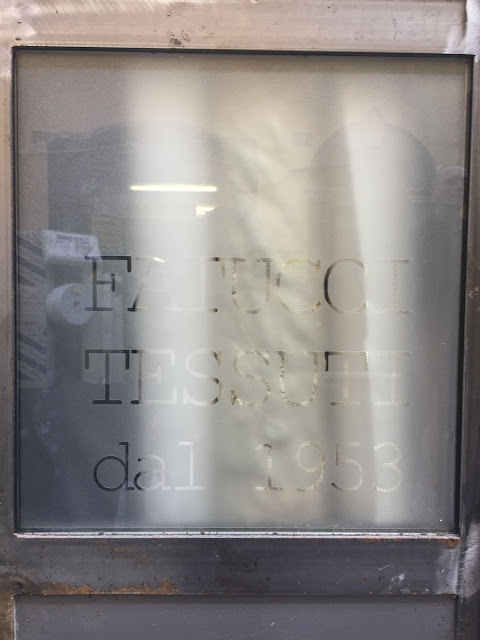 I thought perhaps that it was no longer there, but lo and behold, when I found 64 Via dei Falegnami, I saw the telltale shape of bolts of fabric through the open door! 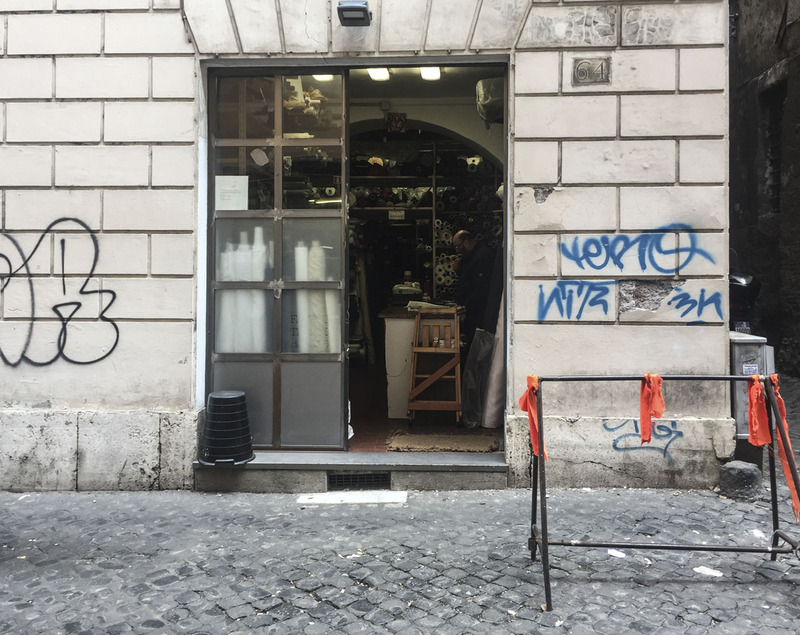 Last time I was in Rome this was the jackpot for me, and I purchased some gorgeous wool suitings and beautiful prints. I'm glad to say the shop is practically the same as it was 4 years ago! In the back are a couple of shelves of gorgeous and reasonably priced wool suitings. Gorgeous, soft, thick wool/cashmere blend heavy suiting (or light coating) for 18 Euros a metre. This was my first fabric purchase of the day. The proprieter of the shop, who spoke English and had a lovely sense of humor, says it was from a lot he purchased from MaxMara. Perhaps it is, it is lovely! I'd show you a picture... but really, it is just black! Next I had my eyes on the lovely prints he keeps right behind his cutting table, but alas the ones that I wanted were 3 meter panels sold by the panel, which was a bit more than my suitcase is willing to hold right now, even at the bargain price of 10 Euros a meter. They were quite unique though, supposedly McQueen and like nothing I've seen elsewhere. 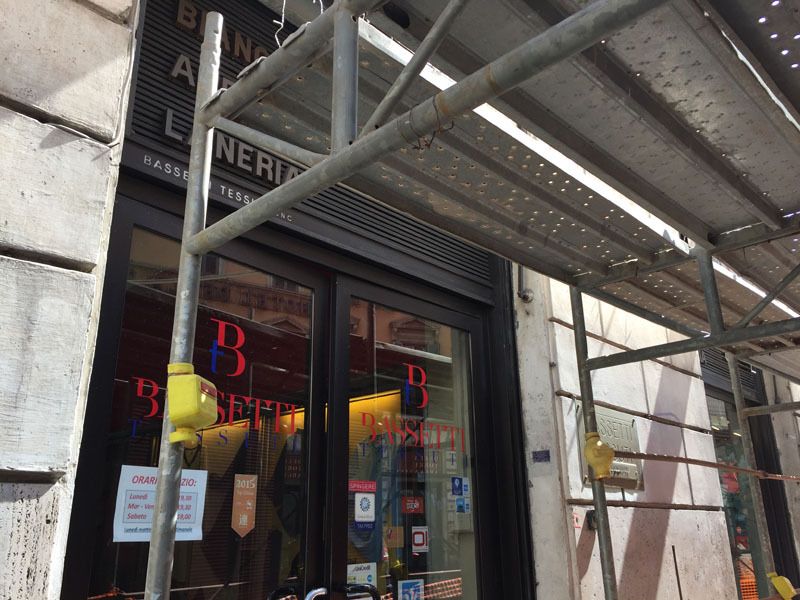 It's actually sort of hard to see right now due to scaffolding covering the storefront. Fashion fabrics are up the stairs. There is room after room filled with fabrics, from floor to ceiling. It's pretty overwhelming! The staff is very nice, if you ask politely (they spoke both English and Italian to me). They have just about every kind of fabric! The wall of silks was very tempting... and many of them were very reasonably priced. However, I had decided that I was going to try to buy a high quality cotton shirting here. To give you a sense of the range, in black shirting they had choices from 6 to 45 Euros a meter. 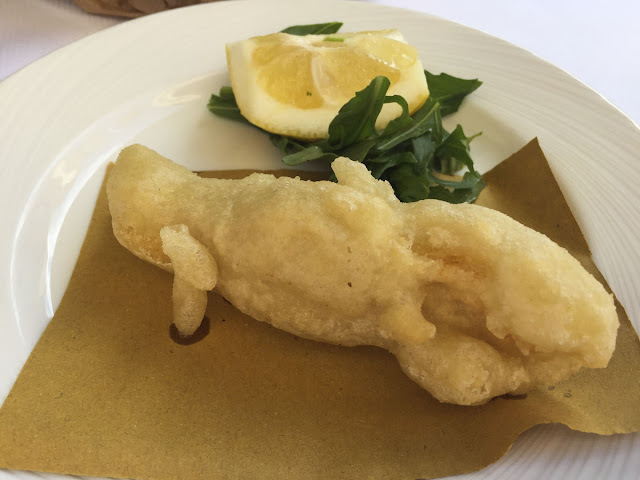 I chose a really lovely cotton that feels as fine as silk for 25 Euros a meter. That's my fabric being cut! Next I went across the square to Azienda Tessile. 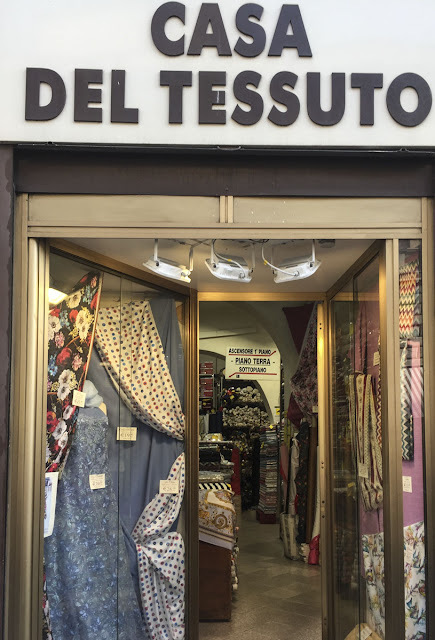 They are they easiest fabric store to find since they have a huge storefront that covers most of the eastern side of Largo di Torre Argentina. 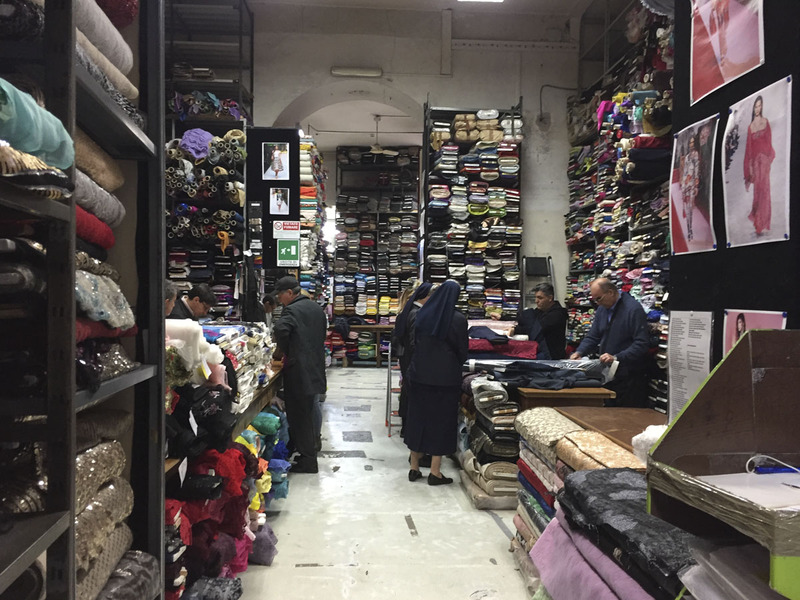 Azienda is less like a giant warehouse and more like a nicely arranged fabric store. 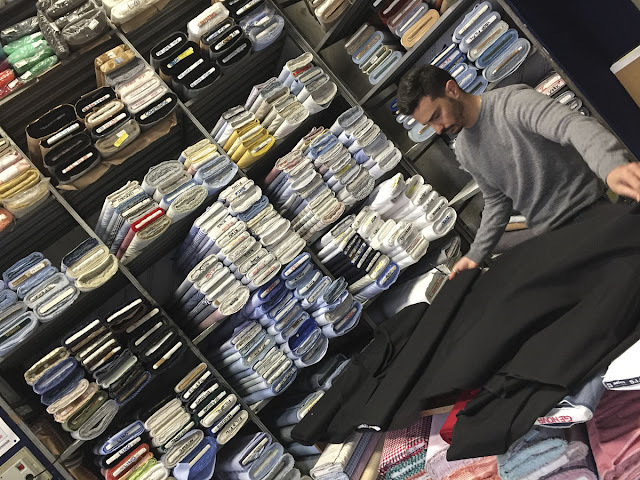 The fabric tends to be stacked behind the cutting tables, which is a bit intimidating if you are just browsing. But if you ask, they will let you go behind the tables and touch, and they are happy to pull out bolts for inspection. Several people in the shop had excellent english, they probably get a lot of practice being located in such a high tourist traffic area. They also have large displays of luxury fabrics. I noted a gorgeous display of designer silks-- unfortunately it was behind a table and I didn't ask to see them since I wasn't really silk shopping. But the display of Chanel fabrics (actual Chanel brand fabric as well as fabrics for Chanel-style jackets by other designers) was in easy reach, and I really enjoyed seeing those lovely, complex fabrics in person. However, 60 Euros a meter and up was a bit out of my budget-- besides, tackling a Chanel jacket is not something to undertake lightly. Also lots of linen and linen blend fabrics, and of course a whole section of suitings, and I didn't even venture upstairs where the home fabrics were. It is luxuriously soft, and I've been thinking about making a striped summer shirt. I was also tempted by a blue and white stripe... I'm trying to exercise restraint here ;). The price was pretty good, at 23 euros per meter for a 60 inch width fabric, that's just about the same as I'd pay for a quality double gauze in the US, and I love the color palette and the stripe width really appeals to me. 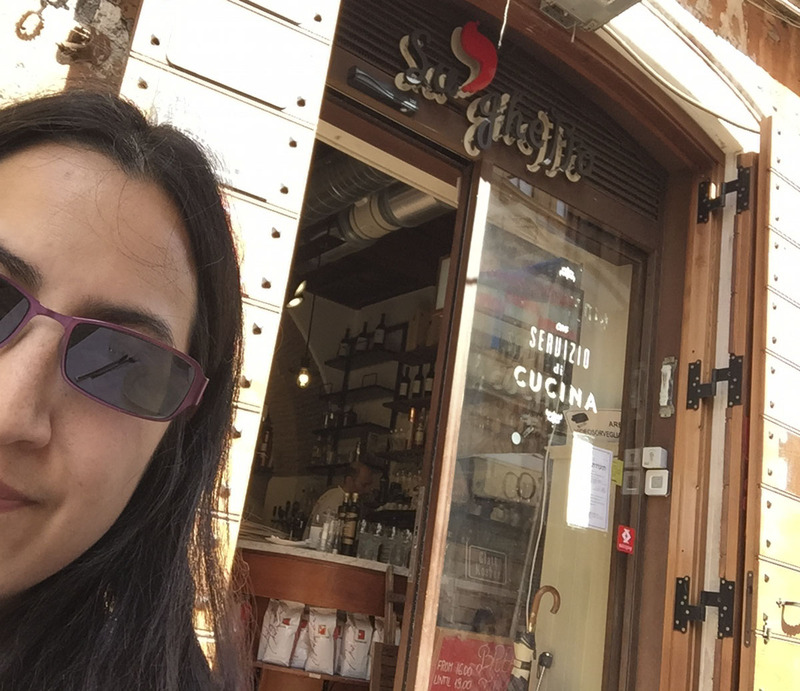 All that fabric shopping makes one hungry, so I had a light lunch at Su'ghetto in the Jewish district. 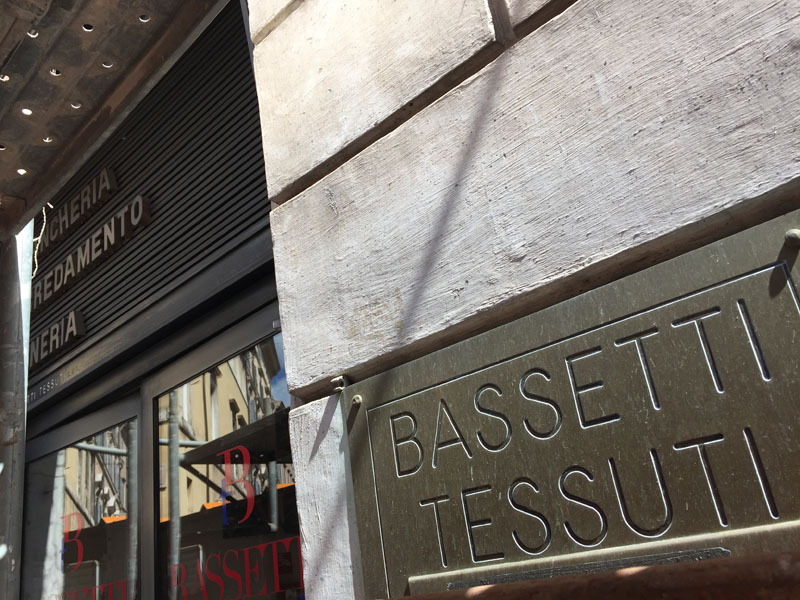 Then I headed off to check out Casa del Tessuto (House of Fabric) which is in an entirely different part of town (Via Dello Statuto 64). 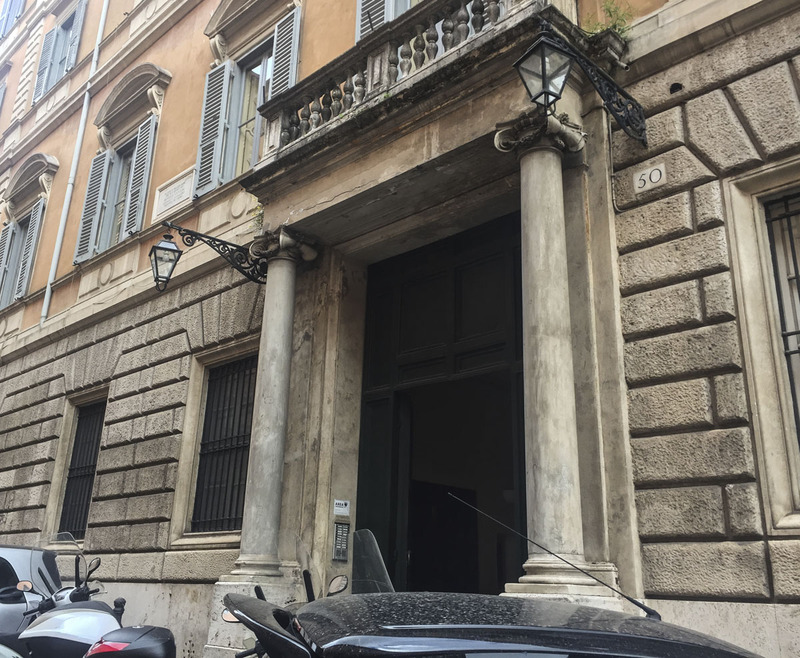 It took me a good 40 minutes to get there, I walked to Piazza Venezia (you could also take tram 8 or one of the many buses that goes that direction), caught the 51 bus to Labicana, and walked north on Via Merulana to Via Dello Statuto. They were very friendly, and when I asked about printed linens, they took me down this tiny staircase to a basement with more bolts of fabric! It isn't a large store, but it is really packed in there and every nook and cranny is filled. They have a whole rack of various designer fabrics, tagged with an example of the designer's work on the runway, a rack of Liberty cotton lawns, and I saw some Missoni tucked away on one shelf. They also had some juvenile themed prints. If I wasn't already quite well situated in designer fabrics (I have both Missoni AND Liberty in my stash... did I mention how large my stash is?) I would have been tempted. However, as it is, I didn't buy any fabric here on this trip, but I was glad the venture took me to another part of the city that I've never been in, which is always interesting. There was one store on my list that I didn't make it to: Valli Fabrics. If I make it there on another day, I'll add it here! Anywhere else I should go?